I heard this concept once at a conference several years ago and it continues to stick with me. Do we have margins in our lives? 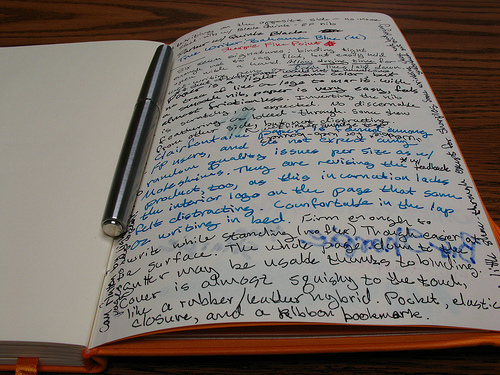 See this notebook page that’s full of writing? The author has used up just about every available space on the page. Yes they are probably great thoughts and worth her time. But she’s completely filled the page. Our lives are like a piece of notebook paper. When we fill them up to the brim, there’s no margin left. No time to slow down, relax, enjoy life. People ask me how life is in Alaska now that we’ve been here for six months. Want to know the main difference? For the last three years I served as an intern at a large church while being a full-time seminary student. I loved those three years for the most part. But life was very full. Yes, I serve two churches now. But I’ve been able to arrange my schedule and life in a way that the margins are clear. I can breathe. I also know I want to be in ministry for the next 40 years, so I can allow myself to slow down. Every single idea doesn’t have to be acted on right now. The margins have allowed me to spend more time with my husband and family. To be available for conversations in person and online because I’m not always rushing ahead to the next thing. I’m more grounded and centered than I’ve ever been in my life. It is difficult to keep the margins clear because the hurry-up-American-work-harder drive is built into me. But I’m becoming more aware of the times where I should kick into overdrive and the moments the space is much more important. The margins are beautiful. God meets us there. Especially during Advent. If so, how have you guarded those as sacred? If not, what’s one change you can make now so that you have more breathing room? Great thoughts! I love reading your blog and think it must be exciting (though possibly much slower) to serve a church in Alaska!! It is exciting!! I love the space, freedom and time to build great relationships. Still time to move quickly when needed and appropriate. Jenny – Thanks for the post. I particularly appreciate the picture as it helps illustrate your point. I have room to grow in this area.